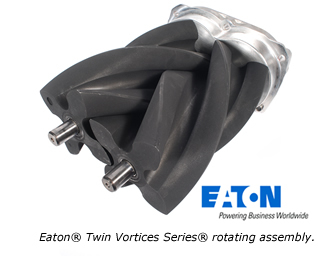 The Harrop range of Superchargers utilise Eaton’s Twin Vortices Series™ (TVS™) technology. 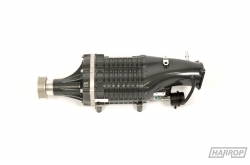 Our range are a Roots-type positive displacement supercharger designed for a variety of engine applications delivering more power and torque for uncompromising, high-performance driving. 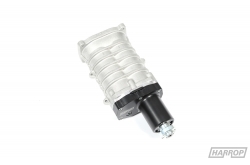 The TVS™ supercharger’s patented design features twin four-lobe rotors with 160-degree twists and high-flow inlet and outlet ports that greatly enhance thermal efficiency, deliver higher volumetric capacity and enable higher operating speeds. The TVS™ supercharger is capable of running with a high thermal efficiency (up to 76 percent) across a wider operating range. The higher helix angle of the rotors coupled with redesigned inlet and outlet ports, improves the air-handling characteristics without increasing the overall size of the unit. 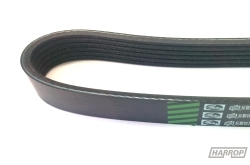 The TVS™ improved noise and vibration characteristics eliminate additional noise-reduction treatments, complexity and system cost. 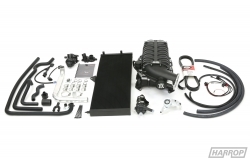 Additionally, the supercharger incorporates a bypass system to reduce air handling losses when boost is not required, resulting in better fuel economy. 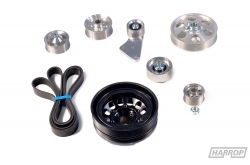 The improvements incorporated into the TVS™ design allow for the use of a smaller supercharger, reducing the package size and weight of the system. 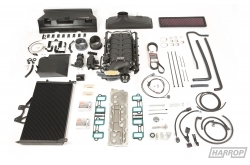 The superchargers range from 900cc to 2300cc per revolution, and all TVS™ superchargers have a 2.4 pressure ratio capability and a thermal efficiency that exceeds 70 percent, which enables more compact packaging and greater output. 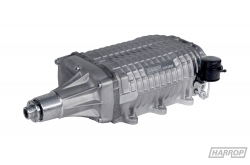 Our range of superchargers set a new standard of performance and reaffirms Harrop and Eaton’s leadership in the performance automotive market.